Only a tiny minority of American academics are Republicans, a fact that is a continuing source of angst for much of the political right, as well as quite a few centrists. It’s generally assumed that this fact requires some explanation specific to the way in which universities work. The implicit assumption is that the group of those qualified and willing to take up academic jobs is roughly representative of the US population, and therefore contains roughly equal numbers of Democrats and Republicans. To state that submission is to see immediately what’s wrong with it. As a group, academics are obviously not typical of the US population. They have much more education and significantly higher incomes, though not as high as those of highly educated Americans in general. We know that these two characteristics work in opposite directions politically. Other things equal, more income is positively associated with Republican voting while more education is associated with lower support. So, a proper test of the idea that there is something special about academic voting patterns would begin with a multiple regression incorporating income and education as explanatory variables, then see if a dummy variable for academic employment was (statistically and quantitatively) different from zero. The midpoint, at which specialities are equally divided between Republicans and Democrats is about $325k. The graph stops at $200k, where the predicted proportion of Republicans is 30 per cent. Extrapolating way beyond the range of the data to $75k (the average salary for full-time faculty in US universities and colleges according to Wikipedia), the predicted proportion of Republicans would be around 10 per cent, which is what’s observed in the data. That assumes that the education variable takes the same value for doctors as for professors, which isn’t quite right. The MD degree takes four years, while a PhD typically takes five. Moreover, much of the MD is taken up with the practical business of learning to do a specific (very important) job, and less with developing skills in argument and reasoning. To the extent that education might have effects on broader approaches to thinking about the world (including politics) I’d expect that grad school would have more of an impact (per year) than med school. So, if anything, this analysis suggests that, at 10 per cent, Republicans are over-represented. On the other hand, it presents those on the right with a simple solution to the problem. Just raise academic salaries to $500,000 a year and you should see lots of Republican professors. In the US, in order to become a specialist, additional years of training are required beyond medical school, which typically lasts 4 years. This is called residency. A surgeon would typically have at least 4 to 5 years of education beyond the 4 years of medical school. This differs from a Ph.D., although many professors actually have post-doctoral years on their c.v. (resume) during which they act as an assistant to a professor. An outstanding Ph.D. graduate might find employment as a professor immediately. It’s disappointing that Dermatology pays so well, not that I’m ungrateful, having had skin cancer. However the residency for Dermatology is shorter than other specialties. They are less educated yet compensated more. This is out of line with the prestige of the specialty. (A dermatology residency is normally much longer than 6 months but less than for other specializations). In the US, in order to become a specialist, additional years of training are required beyond medical school, which typically lasts 4 years. AFAIK, it is the same here. Takes about 10 years all up to become a surgeon. 1. An old saying is that a conservative is a liberal who got mugged. By way of support consider all those photographs of even the football teams from the mid-late 1970s. They all had long hair when it was fashionable before apocryphally ‘getting straight’ with the rise of neoliberalism – Thatcherism/Reagan/Rand and of course Hawke/Keating/Blair etc. 2. I remember >40 years ago in a “humanities for scientists” Psychology course, the lecturer discussing a study of how when factory shift workers became foremen (understand this was the sixties) they tended to change the attitudes and alliances to those of the bosses. So interest in this topic of the mobility of value systems goes way back. 1. Paul and Anne Ehrlich were once dyed in the wool Republicans. Their rejection of the party reflects where the Republicans have move in the past 20 years (response to Bush well before the Tea Party stuff) – away from science and presumably the old Eisenhower republican, towards duplicity and worse which are now part of the Bush/Cheney history. – C P Snow’s “The two cultures” also comments on the differences in politics/attitudes between scientists and engineers as well as the lack of understanding between science and the humanities. – With the rise of neoliberalism an equally interesting question is how many support Hillary v. Berny v. something else again. – (At the risk of being niggly) how do economists line up with left right dem/republican? And whatever happenned to the old Marxists who seemed to widely populate the humanities of old? – They potentially overly simplify the picture without sufficient acknowledging uncertainties. – When shown like that above the potentially imply causality of Y dependent on X which is used to rationalize pre-existing beliefs. The latter may be plausible but this simplification grates. To illustrate , an alternative here would be to invert the plot axes and suggest that the more business oriented people tend to be Republicans and they are more savvy in demanding their remuneration rights and so tend to charge more. This suggests in contrast to the thesis above that it would not help without academics becoming more entrepreneurial or as is currently fashionable “Innovative”. Seems the fields involving most naked pain and closest to death are more likely democrat. Although emergency medicine is dead-set in the middle. I would have thought that qualified as “involving most naked pain and closest to death”. It’s interesting that dermatology are more likely than most to be Republican. That might be because they have more skin in the game. On the other hand cardiologists are hovering around 50% – maybe their heart’s not in it. I assume you can get a similar result if you just track income vs rightwing politics. It may be worse for engineers and less for journalists but your social being always determines your consciousness. It is a misunderstanding if this is attributed to just doctors etc. Economists appear to be a breed apart, David Ricardo was the richest capitalist economist and came up with the principal of comparative advantage. Alfred Marshall was an academic economist and a noted conservative. Marshall moved in academic circles and one of his closest peers was John Neville Keynes, the father of John Maynard Keynes. Milton Friedman was also an academic economist and an arch conservative. Whereas John Kenneth Galbraith was also an academic economist and a democrat voter. Maybe its a Twenty-First century trend. Thomas Piketty, in Australia for a lecture tour, is an exception but then French politics is even more confusing than American politics. As Malcolm Turnball and Bill Shorten showed yesterday, in the House of Reps at least, Australian politicians are either left of centre or right of centre; and, depending on the matter under discussion, not necessarily solely on one side of that fence. Of course some of our senators showed that some are so far right they cannot see the fence. As for Aussie economists, they do not seem to fit any pattern. This probably comes down to our old friend the myth of agency. The rich tend to imagine they got there by there own actions (perhaps believing that Bill Gates would be a billionaire even if he were born in Zambia) and therefore genuinely deserve their wealth. Not many people are fully happy consciously believing the opposite: this scam works for me. Those towards the lower end will believe that their outcomes are more constrained by social systems, so are equally deserving and are missing out. This effect probably works within a professional group too. You are now earning 2x what some of your uni mates are, you probably deserve it. Why not? In the US it seems to me that the Republicans are definitely the “agency myth” party, even, bizarrely, to the relatively poor, underemployed, Trump supporters scraping along the bottom of the bottom of the US economy. “Make America Great Again” is really a code for realigning their lives to the agency myth (as much as anything.) And even if that doesn’t work you can at least have vicarious economic and social agency by aligning to the persona of Trump himself. At the risk of overgeneralising, it is interesting how the more “mechanical” (by which I mean ones where the core skill involves systematically following a set process) tend to be above the line and the more “analytic” (meaning thinking about how things need building hypothesis to diagnose) are below the line. The Nobel Prize in economics goes to Oliver Hart and Bengt Holmstrom for contract theory, the design of incentives. In our textbook, Modern Principles, Tyler and I have a chapter called Managing Incentives which covers some of this work, especially related to Holmstrom’s work on performance pay. Let’s give a simplified precis (fyi, the textbook doesn’t have the math). Well somebody’s heart(s) aren’t in it, that’s for sure. Q: What is te difference between a socialist and a capitalist ? A: Oh, about 50 quid in the bank. And it’s still true (subject to conversion via NPV), isn’t it. Much of the causality for doctors runs from materialism to choice of speciality, and there is also a substantial gender link (women overrepresented in relatively low earnings specialities). … seems like the more interesting question would be, if all professional athletes were required to be awarded a master’s degree before they joined the league, would they mostly be Democrats? Seems to me from that graph that if you drop off orthopedics from the top end and psychiatry from the bottom then the trends is no where near as convincing (chi by eye). I assume orthopedics is skewed by plastic surgeon salaries. 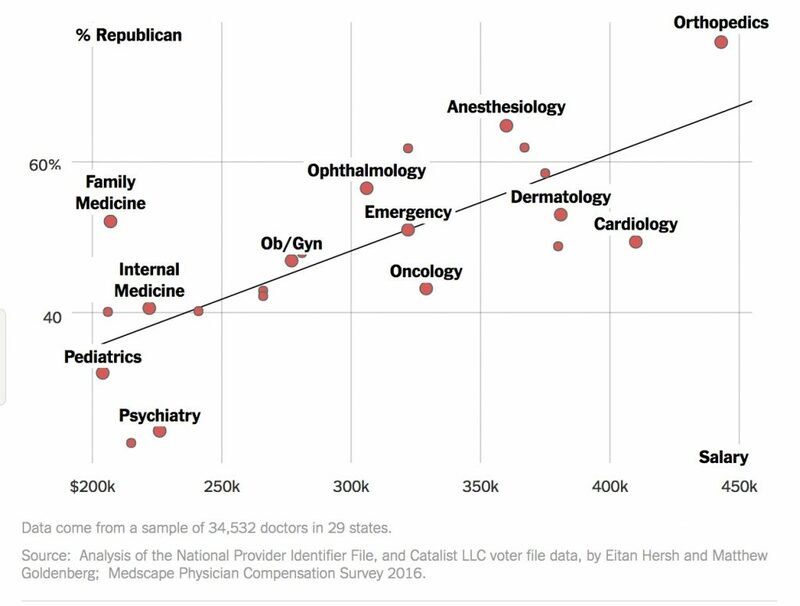 I also assume there is a correlation between doctors (people) who want to make money, capitalist beliefs and republicanism. In that case, academics are not as likely to chase the money and are therefore more likely liberals.